The first two adidas Gauntlet events are in the books and the word is out; adidas has the players, the product and the top events of the spring! We can’t count how many years we’ve seen the top grassroots talent on display, but they seem to get bigger, faster and strong every year and this year is no different. 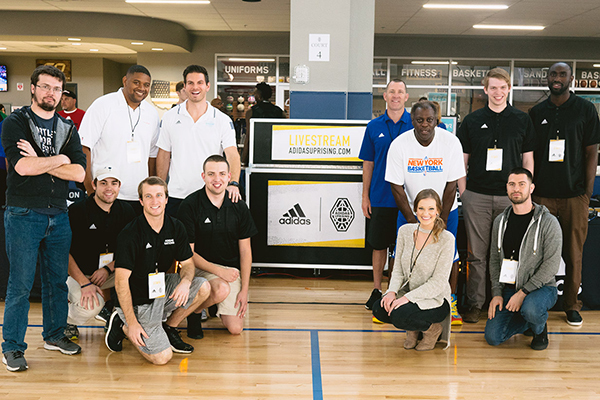 The HallPass Team was hard at work executing the event and digital content along with our adidas family and we’re proud to announce over 1.1 million impressions and 30 games featured on the LIVESTREAM at the new adidasuprising.com site over the two weekends…we’ve all come a long way. These events during the live period bring out all of the top college coaches from around the country and give everyone a glimpse of the future stars in the making. The Gauntlet Finale is July 12-15 in South Carolina, as 30 teams have qualified with 4 regional qualifier automatic bids still up for grabs on Memorial Day Weekend. Some great adidas hoops ahead, HallPass will be with you every step of the way. For more on the adidas Gauntlet Series and adidas Uprising please visit: http://adidasuprising.com/.